No less a thinker than the late Stephen Hawking sought to warn us that our time is running out on planet Earth. Humankind’s continued existence requires us to prepare for mass space travel. We must “go into space for the future of humanity,” he added. But which is more dangerous: staying on Earth, fearing catastrophes such as global pandemics and asteroid strikes? Or blasting off into space and facing the kind of unforeseen dangers confronted by the cosmonauts in the film Salyut-7, whose eponymous space station was launched into orbit April 19, 1982 – 36 years ago this week – and, three years later, began tumbling out of control? In Hawking’s view, the choice is clear. He believed that issues like climate change and population growth will someday make Earth an untenable habitat for human beings, and he gave us a window of 100 to 1,000 years to overcome the hurdles that currently keep our species earthbound. And hurdles there certainly are. Homo sapiens did not evolve to live in outer space, and long-term space travel – even to relatively nearby planet Mars – poses existential threats both known and unknown. 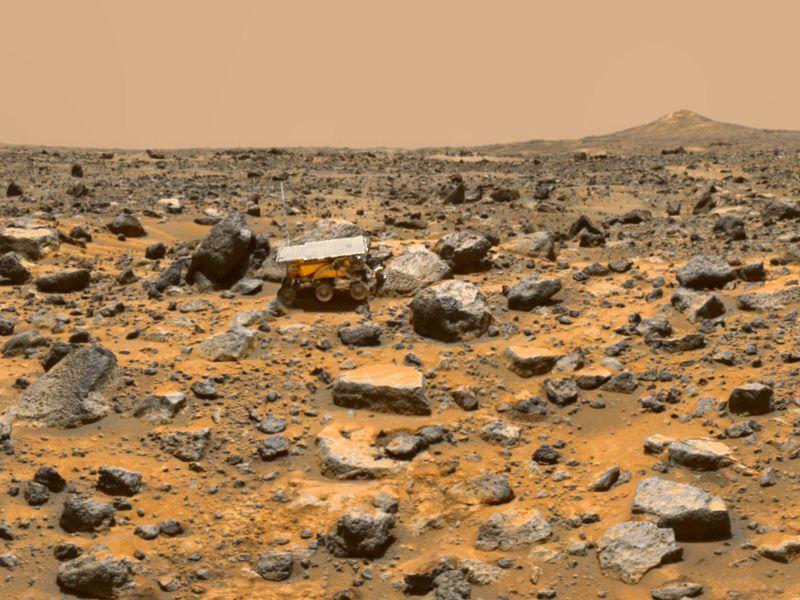 The desolate surface of Mars. Of the known dangers, most can be divided among three categories: technological, biological, and psychological. Technological concerns are probably best understood: how to get a crew into space and onto another inhabitable surface with all the food, water, breathable air, fuel, and equipment required for an expedition of that duration. But, as the disastrous losses of the Challenger and Columbia space shuttles demonstrated, even the smallest oversight impacting mechanical safety can lead to catastrophe. How are humans to survive in the freezing vacuum of space? It won’t be easy – the two main complicating factors are cosmic radiation and the long-term effects of microgravity. Cosmic rays stream everywhere in space, but here on Earth we’re shielded by the planet’s magnetic field. Beyond the safety of our planet there’s no protection. Long-term exposure to radiation can impact cognitive function and cause maladies ranging from anxiety and impaired decision-making to brain cancer and dementia. Microgravity causes muscles to atrophy and bones to lose density. It also affects fluid in the brain and the eyes. Astronauts returning after extended stays in space often have blurred vision and a subtle but consequential reshaping or flattening of the eyes due to shifts in the fluid surrounding them. Beyond biological effects, some believe that psychological “space madness” (a cousin of “cabin fever”) is a real possibility for crewmembers confined in cramped living quarters for extended periods. Will Worry Lead to Pessimism – or Innovation? At this time, none of these challenges have been fully resolved. But they must be, because extended space travel by humans may well be an existential imperative. For the sake of the species, Stephen Hawking argued, we must address – and solve – the dangers associated with interplanetary travel. “The human race has no future if it doesn’t go to space,” Hawkins wrote in 2016. To fail would amount to a crime against the future of humanity.